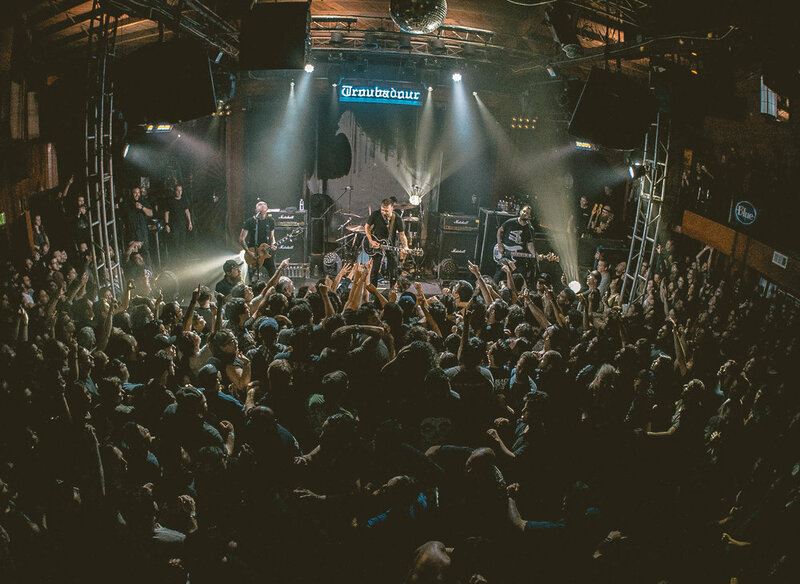 In a 500 cap room packed from wall to wall, Rise Against unchained their inner ‘Wolves’ in an intimate night filled with love, appreciation, and humbleness for devoted Southern California fans. Playing their third and final date on a trifecta of close knit shows taking place also in Chicago and Brooklynn a few days prior, Troubadour was the final cherry for a band that has no fear to “give it all” every time they hit the stage. But this night was more than just a routine performance for RA, it was a chance to give back to fans and let them know they are the reason they keep continuing on. Opening sounds came from Southern California natives Sharp Shock, with solid tunes created by a collision of American and British punk influences. Free spirited and fun vocalist Davey Warsop got the night in motion creating a lively atmosphere with his fellow band mates. As ten o’clock got closer, the crowd only grew louder. Amidst hundreds of bands chanting “Rise Against,” over and over, the band proudly grabbed their instruments and dug in. One song in and vocalist Tim McIlrath took a second to catch his breath and said “I can see how this night is gonna go.” Statement was proven true with each song. As much as fans were there to hear sing along to their favorites on the setlist such as “Survive” and “State of The Union”, most couldn’t wait to hear any and all things new from the band. It’s been three years since their last album, “The Black Market” and this room was eager for fresh tracks. Following the first five classics, the crowd was fortunate to hear the title track to “Wolves,” “Welcome To The Breakdown” and “The Violence” in pure raw form. Keeping true to their early album roots, fast paced sound and influential lyrics, Rise Against definitely have a treat for us all this June. It had been eleven years since the foursome played the historic Troubadour and we can’t think of a place that was better fitting given their history with the venue back in 2006 when they sold out five back to back shows. A 16 song/75 minute set filled with stage dives, shirtless crowd surfers, a CCR cover of “Fortunate Son” and mosh pits including a Troubadour security guard was the best way for these fans to spend their Wednesday night in West Hollywood. Rise Against made sure before they left the stage that they concluded the night with hugs and handshakes of gratitude to as many fans as they could reach because thats just who they are, natural and genuine. If you missed Rise Against on this date, then you can see them at any of the following dates and venues this Summer with Deftones and Thrice. And be sure to pick up RISE AGAINST's newest album "Wolves" coming June 9th via VIRGIN RECORDS. PREORDERS are available now. 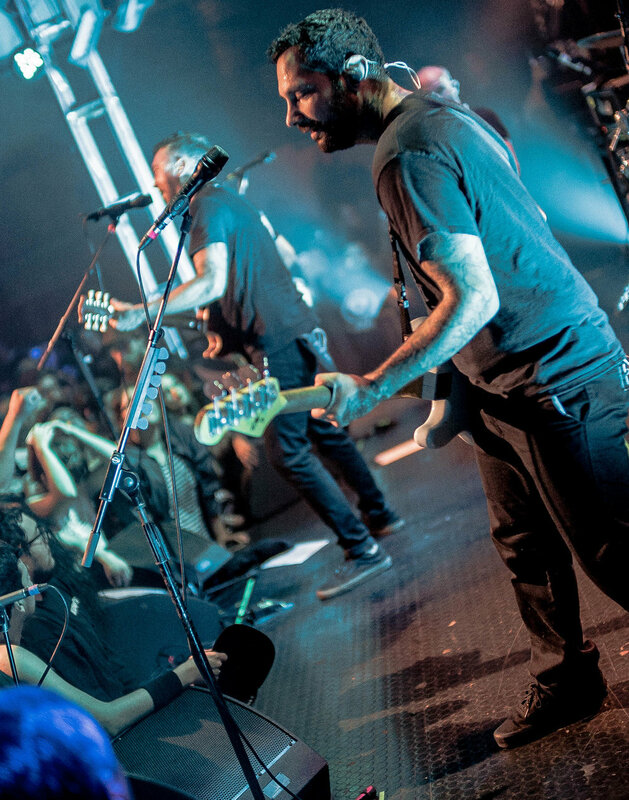 CLICK HERE to see our full photo gallery of RISE AGAINST at Troubadour in West Hollywood, CA.